Clean and refresh your roof tile by removing dirt, grime, algae, mold, and debris. Proper roof tile maintenance your will keep your tiles at there peak performance. Before applying tile sealants, coatings, or color pressure washing is necessary. As our client you can expect a fair, cost effective solution to be presented to you by our professional creative team. Restore your roof to its original vibrant color or choose a new one. Color Coat your cement or concrete roof surfaces for restoring faded and weathered tile roofs. Roof color coats designed with advance pigments to reflect light, minimizing radiant heat that is transferred into your home from roof tiles. Color Coatings ensure a perfect and lasting finish. Is your tile roof looking tired? Are you sick of seeing fading tiles and dirt on your roof? We'll clean, seal and color-match your existing tile roofing so your roof looks new! By using a combination of tile color restoration, power washing, and roof coating, we can make your roof look as good as the day your home was built! Contact Custom Coating today! When it comes to Commercial Flat roofs heat reflective roofing solutions are essential. Having specialized roof coatings outperforms the rest. Our proper application of white and gray silicone roof coatings is guaranteed to not fail under ponding water and consistent severe weathering. Looking to decrease cooling cost and heat stress we got your covered. Custom Coating Restorations is your go-to source for all your roof restoration and preservation needs. 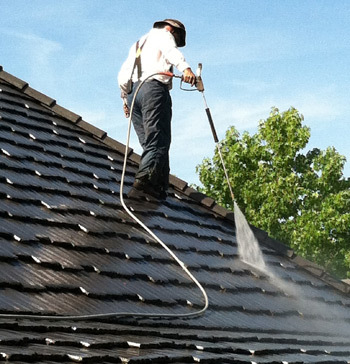 Do you need to power wash a roof before applying a new seal or coating? If so, Custom Coating Restorations can help. Or maybe you’re just looking for a simple consultation on energy-saving coating options. We have you covered there too. We take pride in improving the life and look of your building. Our expert and professional team can seal and color match any tile types and perform a full color restoration to bring new life and vibrancy back to your roof. Custom Coating works with leading manufacturers for color palates such as Boral Roof Tile, Eagle Roofing Products and Nutech Paint. Our team can match existing and even discontinued colors, and design a custom color to match any of your needs. With more than 30 years of experience with tile restoration, roof cleaning and color coating throughout the San Diego, LA County, Orange County, Palm Springs and now Huntington Beach, our expert staff is fully licensed and insured. Custom Coating is also a proud member of the Community Associations Institute and Western States Roofing Contractors Association. We have the ability of matching past and present color schemes of leading roof tile manufactures. For more information or to get a quote, give Custom Coating a call today at 800-621-6722. With thousands of residential and commercial roof restorations completed. We got your covered. Temperatures and sun exposure can accelerate the fading of a tile roof. With Cool Roof Coatings we can make your roof look new again and can with stand temperature exposure and weatherization. Experts at roof restoration we routinely do roof tile maintenance, roof tile pressure washing, roof tile restorations, roof tile staining, roof tile coatings, roof tile heat reflective coatings in Southern California. Please contact us for a free estimate.